OCEANS FULL OF EVIDENCE... That evolution is in over its head! Oceans of evidence inundate evolutionary claims in a rising tide of unanswerable questions! The vast seas of our planet simply CANNOT BE EXPLAINED by empty evolutionary theories! Read, in this article, how evolutionists' guesses have been lost at sea. I pulled as close to the brink of the barren ridge as I dared, set the hand brake on the pickup and, grabbing my binoculars, steppe d out. Glassing the lightly colored clay slopes for Colorado's famed mule deer, I was standing on a wind-swept ledge of rock along a dirt trail in western Colorado. I was not far above the Vermillion river, only a few miles from Utah. After satisfying myself there were no deer in the immediate vicinity, I took time out again, as I had each time I had stopped on this same ridge previously, to stoop and examine the exposed layers of crumbling rock around me. Gleaming brightly were thousands of small, spiraling, agate-like "rocks." But they weren't just ordinary rocks. They were fossils — a whole mountain-top of them — a type of fossil sea snail called "Pyramidellacea" in scientific terminology. And here they were — on a mountain high in Colorado — a barren, dry part of a beautiful state; an area of stunted juniper and cedars, of aspen and sage, of mahoganies and pines. When you're hunting in northwestern Colorado, along the rim of desolate mountains, your mind is about as far removed from the oceans of the world as possible. Yet here was proof positive the ocean had once covered this part of the United States — that teeming forms of life had flourished here thousands of years ago — that where I was standing had once been the site of a catastrophe of sufficient dimensions to dislodge these millions of little shelled animals, and as the laws of nature dictate, carefully sort them according to size and weight as waves had once lashed this same area. Over the years the giant forces of earthquakes, faulting of the earth's crust in huge upthrusts and overfolds, and the ravages of thousands of years of wind, rain and sun — the timeless forces of erosion — had contrived to leave a solid layer of fossils here — in northwestern Colorado. But what was the ocean doing here? Did Life Evolve from the Seas? Almost every amateur geologist has had a similar experience. Every continent abounds with evidence it was once totally covered with the seas. All geologists admit this to be fact, though most deny the oceans covered the continents by design — in a sudden catastrophe such as that described in Genesis 6 and 7. Actually, would geologists admit what their eyes should plainly tell them, there have been two such gigantic, worldwide catastrophes in the history of the earth's crust. The first is described in Genesis the 1st chapter — and the second only a few chapters and an indeterminate number of thousands of years later. Today, the oceans of the world still cover 70 some percent of the total crust of the earth. Today, as then, they teem with life — from tiny micro-organisms to the largest of all creatures — the huge whales that can outweigh an elephant by 30 times. Evolutionists differ wildly in their theories about life's origins — but a preponderant number of them still stick pretty closely to the idea that all life began in the seas. Remember your high-school geology or biology book? Nearly all of them used the same illustrations — or of a similar nature. They showed fetid back-water marshes along steaming oceans literally crawling with various life forms. Giant dinosaurs stood munching seaweed from sleek, bulging, dripping jowls; pterodactyls swung lazily overhead; strange ferns and palms stood silhouetted against ancient skies. The story has it that a sort of primeval "soup" of various chemicals contrived to "strike a spark of life" which somehow "learned" to multiply itself endlessly. From that quick summary of our humblest origins, it's only a matter of illustrated textbooks and carefully aligned fossils to "demonstrate" to the Bored student (who is not really dealing with any specific issues at that age beyond getting grades sufficient to escape the educational process) that evolution sure enough occurred. Worms, snails, fish, amphibians, birds; back to amphibians, to air-breathing fish — the story continues to plod dutifully through millions of years of supposed evolution, carefully knitted together by thousands of expressions like "perhaps", "possibly," "it may seem likely," and "we suppose" and "scientists may safely assume." At the end of it all stands man. The naked ape. The hairless animal. The culprit of the present evolutionary point in time, who will, according to the more cynical of evolutionary seers, soon take his place as a curious fossil form for some yet future, higher form of life to ponder, as "it" (for lack of a better term) may find itself "hunting" or whatever it may be doing- on a barren ledge of rock high and dry on some yet future continent. 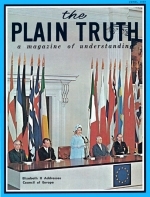 For a long time, now — The PLAIN TRUTH magazine has been running articles covering practically every extreme of the evolutionary tale; showing how evolution IS NOT true; that it CANNOT be proved — and that it is antisupernaturalistic bias and pseudo-intellectual snobbery in the extreme to cling to such theories IN SPITE of oceans full of evidence to the contrary. Recently, I received a note from a leading evolutionist who threatened me with checking into the fairness doctrine of the FCC to find out whether I could be allowed to continue talking against the theory on the radio. If I had not already run into several other such people, I would have been incredulous. Evolution has been given more than "equal time"! Practically every subject you ever studied was as full of evolution as those rocks in Colorado were full of fossils. Mathematics, biology, zoology, paleontology, geology, physiology and anatomy, psychology (especially!) -you name it — was permeated with evolutionary thought. The whole approach was deliberately sidestepping something very important. The text never asked. And, while most students, having been given at least a smattering of some religious belief or another by parents, would have vaguely wondered from time to time how to reconcile the ideas of religion with what the textbooks said — it probably never got much of an airing in class. And the textbook authors seemed perfectly satisfied. They didn't mention it, either. Evolutionary theories have been given tar more than "equal time" in EVERY possible means of public communication, and shockingly, to a greater and greater degree even from the pulpits of churches. A large percentage of so-called Christian ministers BELIEVE IN EVOLUTION. It's time you saw the whole picture. It's time you faced plain truths simple facts. It is not "unfair" for laymen to ask simple questions of evolutionary "science" (falsely so-called). After all, if our logical minds are the end result of a PROCESS called evolution, then that product of a process should be able to comprehend the process, wouldn't you think? For many, many months now, we have been showing the shattered shards; broken remnants, bits and pieces of a purely fabricated patchwork of guesses and irrelevant analogies called evolution. Continually, it has been pointed out how it is utterly IMPOSSIBLE for creature after creature to have GRADUALLY EVOLVED. We have shown how each creature, with his own peculiar habits, would have to have been doing exactly as he is doing NOW — and doing it from the MOMENT of his first instant of existence! Evolution is dealt a death blow if it can be PROVED that anyone creature EXISTS for the very purpose of contributing to, directly aiding, supporting and providing for, the existence of another creature. In other words, if it can be DEMONSTRATED there are living things which exist SOLELY for the existence of OTHER living things — then evolution is demolished. Each HAD to come into existence SUDDENLY — at the PRECISE INSTANT as did the other. But FAR beyond this serious challenge to the empty theories is the fact that not only do certain CREATURES exist for the specific survival of other creatures-but that the entire panorama of LIVING THINGS — ALL LIFE — fits into the same pattern. There is nothing which could more graphically illustrate this than the oceans of the world. There is a mysterious pyramid of life in the oceans — a "chain of life" or a "web of life" that is amazingly complex, and harmonious. It involves the very smallest of living creatures, and the largest — at both ends of the chain. This article will show you how the oceans with their vast, almost limitless horizons of heaving waves, and their billions of billions of living creatures and plants, are in actuality somewhat like a single, living, moving organism — a totally united, complex, interdependent system of life — each part utterly dependent on each other part to remain alive! And in this article, you will see revealed yet another stunning, fatal blow to evolution! Once, the seas covered all the world. There is not a continent where scars of ancient sea activity are not still visible. Many of the materials in our finest buildings are remnants of ancient ocean life — from the fine travertines and marbles to glittering mother of pearl. Some of the most outstanding features In geography are the result of ocean activity — like the world-famed "white cliffs of Dover," which is proof of a huge cataclysm which buried billions of shellfish suddenly. Our oceans are absolutely vital to our own lives; not only from the obvious dependence of many nations for their principal food supplies, but from more subtle causes. Without them, the world would not have its weather patterns, Some ecologists estimate up to 70 percent of our oxygen is produced by tiny diatoms in the seas. The seas have been used since mankind first trod the earth as the receptacle for man's wastes. Not only are the oceans an absolutely vital requisite for life on land, and therefore an intricate part of a total worldwide balance, but the seas themselves are like a separate " Living organism," made up of "deserts" where little life is found, and tangled jungles of kelp or seaweed abounding with life. "Rivers," or ocean currents, Row through winding paths in all the world's oceans. These flowing currents directly control climates in much of the earth, and formed the invisible rivers upon which many ancient human families migrated (as has only recently been proved). Without these flowing currents, Britain would be inhospitable for most life, and the extreme northwestern United States would be far more frigid. Seventy percent of earth's surface is covered by ocean water — and yet, only 5% of the ocean floor has been investigated. It is estimated that 5/6 of the total amount of living matter on earth lives within the upper, sunlit part of the oceans. Not only do the oceans directly regulate climates, temperatures and rainfall over much of the earth — but the little-known, interlocking, interdependent WEB of life in the seas is indispensable to life everywhere! The great majority of all oceanic life is not the fish we know. It's not even the tiny crustaceans or other life we might see at the beach on a Sunday afternoon. A full 99% of all ocean life is microscopic — seldom even seen by humans! This 99% of all ocean life — called plankton, collectively — lives within the upper 100 feet of the ocean surface. This prodigious amount of plant and animal growth makes up the very base of the food chain of the sea Or what is called the ((pyramid of life." Plankton is also called "grass of the sea." Plankton is a collective term including all ocean organisms, both plant and animal, which drift about at the mercy of ocean currents. Plankton includes anything from microscopic plants and animals, all the way up to 2-inch krill of the Antarctic seas, which form the diet of the great blue whale. At the very bottom of this chain of life in the sea are the billions upon uncountable billions of microscopic forms of life which form the mainstay of food for the tiniest of fishes. As the organisms get smaller, they appear in enormously greater numbers. For example, diatoms — the microscopic plants which are food for larger animal plankton — make up 6/10 of all planktonic life in the oceans. If 99% of all life in the oceans is plankton, and 6/10 of this plankton is tiny, microscopic diatoms, then diatoms must appear in the oceans in prodigious numbers! And that's exactly the case. With the right amount of sunlight and nutrients from the seawater, diatoms will begin growing and dividing at the rate of AT LEAST once per day. If conditions permit, one diatom alone could multiply into the ballpark figure of 200 billion cells by the end of a month! Almost. But we begin to see the need for enormous numbers of these diatoms when we understand their purpose. Small ocean animals called copepods may eat as many as 120,000 diatoms every day. These copepods in turn are eaten by larger fish in huge numbers. For example, in the belly of one herring were found 60,000 copepods! food to be called the "grass of the sea." comparable to hay in nutrition value? The answer lies in the diatoms' basic ability to synthesize food from sunlight and nutrients of seawater. These microscopic one-celled organisms take chemicals from the sea and energy from the sun, and by the miracle of photosynthesis produce the sugars and starches which are the breadstuff of all life. And of all the photosynthesis which takes place on earth, about 70% takes place in the sea! Yearly land production of sugars and starches within the cells of all land plants amounts to something like 40 billion tons. However, in the sea we find that figure doubled or even quadrupled to a mammoth 80 to 160 billion tons! The miracle substance of photosynthesis is chlorophyll. Looking into the oceans, one would expect to find the warm tropical waters to be teeming with life, and the cold Antarctic to be nearly void. However, that's not true! And for definite reasons. There are two main factors which control the growth of life in the oceans. 1) Amount of sunlight available for photosynthesis, and 2) amount of nutrients within the seawater itself. If one or both of these factors are not in proper balance, then planktonic life will dwindle and die. And if the plankton dies, the larger plankton feeders must seek other areas for food, or die. Ultimately, all the ocean is dependent on plankton. And plant plankton (primarily diatoms) are dependent on the two above — sunlight and nutrients. In tropical waters, we find that sunlight is available for long periods during the year. Why then do we find much less quantity of plankton here than in the cold waters of the Antarctic? The answer lies in the ocean currents which do not bring the tropics the great amounts of nutrients. But in the Antarctic we find that just the opposite is true. The cold waters there are rich in nutrients, with enough sunlight during the daylight hours, that the Antarctic seas are literally teeming with life, sometimes referred to as a thin soup or broth. To the right, one of the 155 species of brotulids. They run a full gamut of tremendous variation in color, shape and size. The brotulids exist in a great variety of habitats - from the greatest ocean depths to freshwater coves. Below, hermit crab "rests" on a rock - framed by a tubeworm fan, The hermit crab protects its soft tail by hiding it in the coil of an abandoned shell. This is another example of an intricate relationship. Wells (below), Gentry (right) Ambassador College. Photo at right courtesy of Steinhart Aquarium. Below, a yellow tang, one of the family of Surgeon fishes, dubbed with this name because they possess sharp "knives" just in front of the tail. The hinged blade can suddenly open like a switchblade. This is only one of the many protective devices fish have been endowed with by a Creator God. Above, one of the most unusual fish alive - the shrimpfish. Some researchers have seen this fish swimming along the bottom of underwater coves - with their heads pointed downward. Gentry - Ambassador College - Top photo courtesy of Steinhart Aquarium. Inhabitants of a Mysterious World - Right, a camouflaged stonefish. Can you see his eye, mouth and body line? On the ocean floor this deadly fish so closely resembles a small rock, it is virtually invisible as it lies half buried in the sand. Left, a convict fish swimming harmlessly among the tentacles of a poisonous tealia anemone for its own protection. Two more interrelated handiworks of God's creation. Furthermore) the Antarctic has just the right balance of sunlight and nutrients to produce enough food for the largest of all mammals — and animals, for that matter — the great blue whale. The nutrients needed by diatoms and other plant plankton to synthesize sugars and starches are found in decaying matter which constantly settles to the ocean floor. Here, miles below the surface. bacteria decompose this dead matter as it descends like snow into the depths. The waters there are very cold and dark. Very little life can possibly live at these depths, because very little or no sunlight at all can reach these areas. However, as warmer waters on the surface are rapidly depleted of their supply of nutrients, somehow the cold water from below must bring their rich nutrients to the surface, or diatoms cannot synthesize food, to be eaten by other plankton, to be eaten by larger fish, etc. Here is where ocean currents come into play. By a complicated process which man still does not completely understand, currents from the ocean mid-depths flow south toward the Antarctic seas. At the same time surface currents from the Antarctic and a much deeper cold current from melting ice are flowing NORTH. The resulting current flowing southward is sandwiched between the upper and lower northbound currents. It brings a constant supply of rich nutrient waters from the north! Here in these waters diatoms flourish, synthesizing the foodstuff on which larger plankton live. Fisheries are usually most productive where these cold water "pastures" occur. An amazing, complex chain of events occurs. And an imbalance of these events would wreak havoc on Antarctic life, even if just one link in the chain were dropped out! Now we can see the reason why the tropics do not enjoy such a rich abundance of plankton. There we find no constant upswelling of nutrient-rich waters flowing up from the depths below. And, even though the sunlight is abundant, sunlight alone is not enough. Yet even so, the tropics are rich in their variety of life — but not in great quantity, as plankton of Antarctic seas. Even the so-called "deserts of the sea" contain a surprising variety of life. One famous example is the Sargasso Sea. Here, no ocean current passes through. The whole sea appears to be a giant slowly spinning mass of water with very little exchange with the outside ocean. Even so, it is the spawning grounds for the European and American eels, and host to a variety of other life. To show the vast amount of available food found in Antarctic seas, let's look at the great blue whale. Baleen plates within the blue whale's mouth filter out several tons of plankton (krill) every day. A female must devour many tons of krill in order to feed her young calf a ton of rich milk every day. Every year 40 million tons of fish are removed from the oceans. And still the sea seems not to flinch at giving up these enormous quantities. After all, 9/10 of the earth's vegetation is produced in the sea. And adding up all the living matter of the oceans we have the prodigious figure of 100 billion tons yearly! Acre for acre, the sea is more productive than the lands of the earth. Eat — and Be Eaten! In the oceans' pyramid of life, there is the constant cycle of "eat and be eaten." And most of the weight of what one animal eats will be lost in energy and heat. For example, each pound of killer whale represents some 5 tons of diatoms and other vegetation. Of course, the killer whale does not eat diatoms. He eats smaller fish which eat even smaller fish, which eat zooplankton, which eat other plankton including diatoms. At each step in the pyramid, 9/10 of the weight of what is eaten is lost to heat, energy, and other factors. Only 1/10 of the total weight is converted into actual body tissue having weight. The principle, therefore, is that the more steps in the pyramid, the more pounds of food it takes at the base to support a few pounds at the top. So, there are always FEWER ANIMALS at the top than at the bottom of the pyramid. It has been estimated that the sea must produce five tons of living material for one man to gain just one pound. This is because man is at the very pinnacle of the pyramid. On the other hand, a baleen or filter-feeding whale can gain one pound from an original 100 pounds of diatoms. That's because there is only one step between the diatoms and the filter-feeding whales, namely krill. The whale feeds on krill, which feeds on diatoms. But in the case of man, it's quite a different story, which might look like this: Man feeds on tuna, which feeds on herring, which feeds on animal plankton, which feeds on diatoms and other plant plankton. The pyramid of life is a complex structure, much more than one would expect. And nothing lives to itself, dies to itself — or disappears from the cycle of life. And within these cycles we find baffling problems which rise up to make evolutionists scratch their heads. One author admits: "In the plankton we meet an even more baffling question: Which is the parent and which the child? "Take the Salps (members of the Tunicate groups). When the eggs hatch and the young grow up, they are different animals from their parents — so much so, in fact, that they originally were described as a different species. What is more, this second generation does not lay eggs. Instead, it grows a long chain of buds, which finally break of! to grow up into the egg-laying generation again. Are we coming to answer these seemingly unsolvable problems? As you can see, it is disastrous to sea life when man adds poisons to the oceans, upsetting the delicate balance of chemicals. Dozens of creatures of the sea migrate — many of them over thousands and thousands of trackless miles. The mysteries of salmon, tuna, eel and whale migrations are completely baffling to scientists, and each, in itself (and there are dozens of examples) presents another shocking blow to the solar plexis of the shabby framework of evolution. But even the tiny organisms called plankton migrate. They travel hundreds and thousands of miles — by merely migrating up and down. Every night, the tiny creatures rise to the surface waters — sinking again to deeper water as the sun's rays begin to shine. By night, the surface can be a veritable "soup" of planktonic life — and by day appear to be empty. As the tiny creatures are submerged, the surface waters are moving at a more rapid pace than those deeper down. Thus, plankton not only "migrate" up and down, but each time they rise, they are in different waters than before. But WHY do these little microorganisms migrate? It is not really known, except that if they did not, there would occur such congestion if plankton rode only the upper currents that some areas of the sea could become stinking, rotting planktonic "log jams," while others would be devoid of life. It is believed there are entirely different ocean currents beneath the surface, which move in OPPOSITE directions to the upper currents. This means that, even though plankton are "traveling" perhaps hundreds of miles because the waters are being CHANGED continually, they remain in comparatively the same horizontal position! The migrations of whales and many fish are dependent entirely on the areas of heaviest concentration of plankton. This is only a tiny part of the story. The many examples of "cleaner fish," without which other fish could not survive, the examples of various species of fish which can live only in an environment (such as the poisonous tentacles of a sea anemone) that would kill other fish, and various other community — type interrelationships all combine to give evolutionists whale-sized nightmares. The many examples of symbiosis (constant COMPANIONSHIP) should fill books — but we have space to give only a few quick examples in this issue. Examples of a close companionship called symbiosis are numerous the world over. The hermit crab sometimes attracts a sea anemone to live on the crab's shell. As a result, the anemone receives mobility and gets bits of food the crab has left. The crab also receives some benefit, and the crab has been known to transfer his anemone from an old shell home to a new shell when moving. The Portuguese man-of-war is host to a daring little fish called Nomeus. Some writers have said their relationship is mutual — that both benefit. However, others have claimed that the little Nomeus is not immune to the poisonous tentacles of the Portuguese man-of-war, but careful not to touch or brush against the tentacles. If the fish IS caught in the tentacles, it will be killed and eaten just like any other fish. The feeding habits of little Nomeus are quite interesting, as well. Out in the oceans, the Nomeus apparently lives on a steady diet of man-of-war tentacles. Nomeus has a special pouch behind its mouth for storing and neutralizing the poisonous stinging cells on the tentacles before they pass into the stomach. Most scientists and observers thought the shark-remora relationship was one-sided, that the remora received all the benefit of a free ride, and scraps of food from the remains of a shark's kill. However, more recent studies have shown that the remoras probably give the shark's body a THOROUGH GOING-OVER for parasites and sores, cleaning off any harmful debris. Remoras have been known to move in and out of the mouths of other large fishes, such as the mola mola, a giant ocean sunfish. They attach themselves inside the mouths and gill chambers, without any apparent irritation to the host! Perhaps the most striking — and well known — of all the examples of symbiosis occurs between the little down fish and sea anemone. Marine tropical fish stores sell these to collectors and hobbyists the world over. Here in the Ambassador College Research Laboratory, we have kept a number of these little creatures for lengths of time. We found that certain of these two-inch colorfully orange and white clownfish pick a certain anemone for "home." Here, the clownfish nestles and cuddles into a feathery bed of protection and security. Whenever an enemy would approach, the clownfish would dart quickly into the poisonous tentacles of the sea anemone. Almost as if saying, "Come on inside and get me!" Of course, before the other fish could possibly grab the clown, the poisonous stinging cells of the sea anemone would have the attacker disarmed and dying. In our saltwater aquariums, we fed the anemones and larger fish sizable chunks of shrimp, kept frozen in a refrigerator. In many cases, the clownfish would swim quickly to the top of our tank, receive a chunk of shrimp, and immediately dart back to the anemone and deposit the food within the tentacles. Then the clownfish would return to the top for another piece of shrimp, to repeat the same process over and over until there was enough food for the anemone and clownfish. Upon satisfaction that there was enough shrimp in the house, the clownfish would nestle down into the tentacles, having completed his job for the day! Example after example of symbiosis and mutualism fill the oceans. And no doubt all the examples of these striking relationships have not even been discovered. Everywhere scientists and explorers look they find a watery world of complexity beyond their expectations. And, as always, these mutual relationships immediately pose the question — WHICH CAME FIRST? Evolution does not claim these creatures SUDDENLY "leapt" into some sort of being — and immediately adapted to an interrelationship necessary to the survival of both! For how many millions of years did clownfish DIE trying to snuggle into the poisonous tentacles of an anemone until they finally "learned how"? But if they died, then they don't exist! But they DO exist — doing just what they do — and both the clown and the anemone benefit. Why do the very LARGEST of all creatures survive by feeding on the very SMALLEST — such as whales and plankton? And WHICH CAME FIRST? The plankton? Then why do not ALL whales feed on it? Why do some whales eat FISH — certainly an easier and more satisfying diet than simply swimming around all day with your mouth open, gulping tons of water and filtering out the plankton! Did some whales begin to grow teeth when they found NO plankton? But there has NEVER BEEN SUCH A SHORTAGE. Then why develop teeth) Or, if all whales were supposedly toothed whales — then WHY DISCARD them? And HOW LONG did it take to develop those huge, brush-like filters? And could teeth and growing filters fill the same mouth? Not only are there totally inexplicable interrelationships between completely different creatures — each of which cannot survive without the other — but the ENTIRETY of the oceans presents a throbbing, vitally alive, interrelated chain of life to the evolutionist to explain away. Can you comprehend it? Can you be honest with yourself? Does it REALLY make sense to you that the breathtaking complexity of LIFE — all life, including man, and man's own MIND — could have happened as a final result of mindless, dumb, unintelligent, happenstance — randomness — and NOT be what your own intellect should TELL you it is — the result of a SPIRITUALLY BRILLIANT MIND, the creation of a GREAT CREATOR whose mind is so FAR above that of humans it is AWESOME?! You look at a creation of marvels beyond description — laws beyond finding out — curiosities unimagined. Yet it is OPERATING — functioning — vitally alive! No, creation is NOT POSSIBLE without a Creator! Laws are NOT POSSIBLE without a LAWGIVER! Design does not happen without a DESIGNER! Life does not occur except from PRE-EXISTING LIFE OF THE SAME KIND — and is NOT POSSIBLE without a LIFE GIVER! Your Creator, who gives you every beat of your miraculous heart and every breath of air you draw into your miraculous lungs, used the huge denizens of the deep to HUMBLE the most self-righteous man who ever lived — Job. You ought to read the account in Job, chapters 40 through 42. And then ponder again what you have read in this article, and the others in our series on the claims of evolution. Think about the huge whales, the giant sea eels, the monstrous sharks and sea turtles — ponder the fantastic web of life in the seas — so vital to your own existence — and see if you can intelligently deny your God! No, evolution is no excuse. God Almighty says YOU CAN prove His existence by the "things that are MADE" (Romans 1:20). As in no other era in history, God has placed in the hands of His servants the tools to PROVE, even by the laws of science, His existence, and to publish and preach that proof to all nations around the world! Keep looking for future articles in The PLAIN TRUTH about the marvels of this fabulous "good earth" we live on — and come to KNOW that your God EXISTS — and begin to FIND that God, and get to KNOW HIM!